Annoyingly, Zoroark-GX Control is a deck that never seems to die off. The Expanded format is a stomping ground for this powerhouse, as it provides the deck with many more degenerate cards to boost its disruptive power. Most recently, Zoroark-GX Control has found success in Standard, winning this season’s Latin American International Championships, but before that, Isaiah Williams took it into Top 8 at the Expanded Portland Regional Championships. We haven’t yet seen an Expanded event with Lost Thunder legal, and let me tell you, that set sure adds a lot of new cards into the mix for control decks — Girafarig, Unown, and Faba, just to name a few. In Standard, Zoroark-GX Control never seems to do well when it’s expected (as we just saw at the Virginia Regional Championship), but in Expanded it’s a whole different story, since the deck really doesn’t have a counter in that format. It can be hard to counter a deck when you don’t even have a hand to start with thanks to Delinquent combos, and there’s a new card that gives Zoroark-GX Control another tricky win condition…but more on that later. This deck is by far my top pick for the upcoming Anaheim Regional Championship, and I’d like to share my knowledge of it with you. The deck is hard to play at first, but you’ll find after some practice that its gameplay is fairly systematic. In this article you can expect to see my current list, some alternative card choices, a rundown of important matchups, and more! Having two Exeggcute lets you negate the cost of any of your cards that requires two other cards to be discarded — in this deck, Plumeria and Ultra Ball. This is especially important in the late game when you need to manage your cards wisely so you don’t run out of resources. Of course, there is also the well-known “broken” Propagate plus Trade combo with Zoroark-GX. Hand is an insane Ability in a deck like this one. You can drop Unown out of nowhere and instantly win the game if you have 35 or more cards in hand. This helps you speed games up against slow opponents or opposing mill decks. 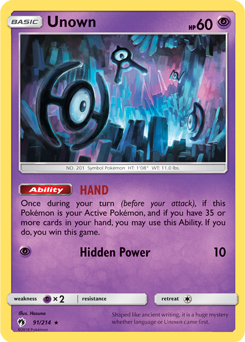 The opportunity to add a whole new win condition to the deck means I think Unown is too strong not to include. You can abuse the Propagate plus Trade combo to continually build your hand size up to the winning number of cards. This is another way to lock opponents out of games. You can use Quaking Punch when your opponent doesn’t expect it, possibly forcing them to use up non-Item resources they had planned on saving for later. In combination with Trick Shovel, you can control your opponent’s topdeck as well as their hand for the ultimate lock. Girafarig‘s Get Lost attack can dramatically swing the mirror match in your favor by sending your opponent’s resources to the Lost Zone, where they can never be recovered. I think ultimately I will choose to run only one of Girafarig or Faba , but for now I’m playing both. Faba is a little more multi-purposeful, as it can singlehandedly beat Seismitoad-EX decks by removing their Energy for good. Girafarig is only really good in the Zoroark-GX Control mirror. Garbotoxin is powerful against every deck, but especially against Zoroark-GX and the new Zebstrika (which will likely find a place in many Expanded decks such as Night March). This allows you to play the aforementioned Garbodor, and serves as a “fifth” Zorua as well. Hypothetically you could add other Stage 1 techs as well, and I’m musing over one in particular: Garbodor from Guardian Rising. Cold Crush GX is needed in to beat Energy acceleration decks like Buzzwole-GX and Rayquaza-GX. Should you ever play against Primal Groudon-EX, this is a key card for winning that matchup as well. Legendary Ascent is an added bonus to ensure that you can get Articuno-GX into the Active position without needing a switch effect.